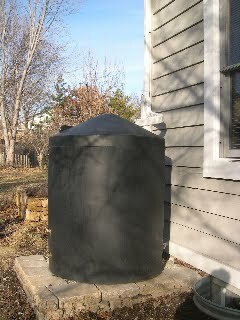 I have two 65 gallon Rainwater Urns I ordered from Gardeners’ Supply Company and three 300 gallon Good Ideas Rain Wizard Rain Barrels I ordered directly from the manufacturer. Both companies have wonderful customer service. store them in the garage over winter.) 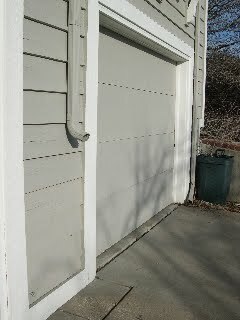 But here’s the space between my two garage doors in the front of the house where one of the urns usually stand. I should probably reattach the longer downspout so water doesn’t splash on the siding when it rains in the winter months. 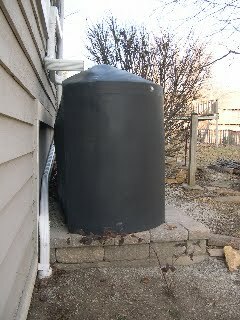 Since it’s the front of the house I wanted something more attractive than the rain barrels I was finding locally. I’m very happy with the ones I got from Gardeners’ Supply Company, even though they are a bit pricey (the latest catalog lists them as $219 plus $20 extra shipping). They have an overflow valve so when it really pours the excess water simply flows down the driveway and into the street. I’ve gotten a lot of compliments on how nice it looks. The recessed basin on top is for displaying a potted plant. It’s so hot on the south side of the house that I’m not sure what would survive there. Here’s the urn in the garage. Here’s where the second urn sets. 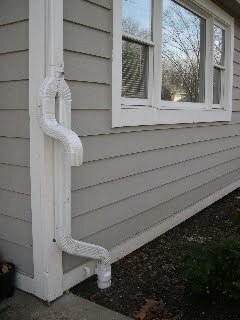 downspouts. There’s a little switch where the downspout splits. 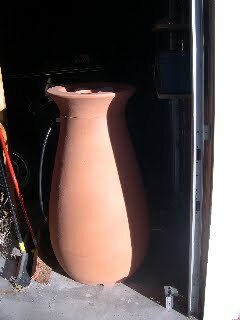 When the urn is full, I just divert the water underground, under the patio, out onto the yard. 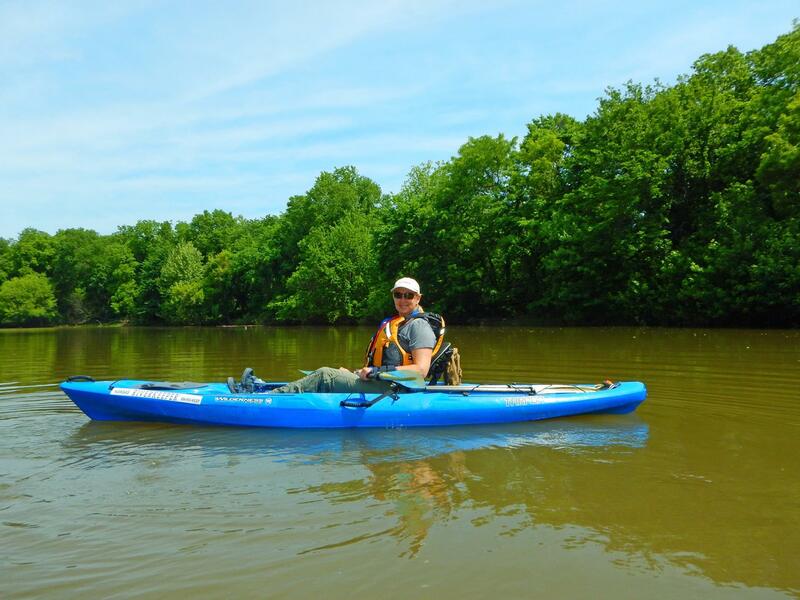 I pulled out the white cap so you can see where the water diverts to. I have a similar set-up for the Rain Wizards. 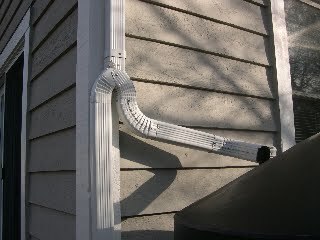 The main downspout splits into two. 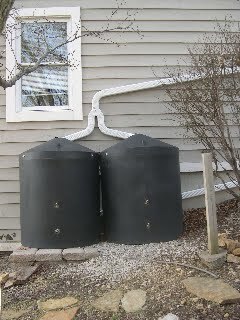 One downspout goes to the rain barrel and the other carries the water underground out onto the front lawn minimizing erosion. f cute for holding 300 gallons. It has a flat back design so that it can be pretty close to the house. 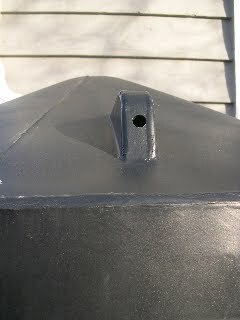 I have this barrel rather far so that I can get at the water spigots on the house corner. Here’s the overflow valve, which is pretty much useless in a Kansas downpour. I love the fact that there are two spigots. I can use the top one for filling watering cans. Both, of course, can have a hose attached, but the lower one allows me to get the barrel pretty empty for the winter. These, by the way, were not cheap either: $400-$500 each. But I like having this much water. Same set-up on the east side with the split downspouts. 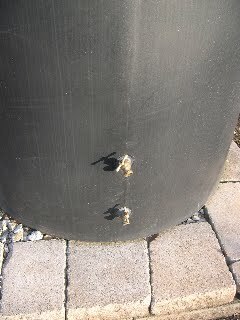 The downspout splits again between the two barrels. I initially tried to connect the two barrels, so that when one is full the water flows over to the other one, but found that a small hose couldn’t accommodate Kansas downpours. Jerod Nieder from Jayhawk Guttering was very good about implementing my design. I have these closer to the house. 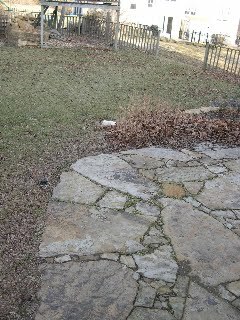 The underground downspout empties out onto the front lawn. You can see a bit of it before it goes underground on this photo. I also have a so-called French drain on the east side of the house to handle water runoff from the neighbors uphill. You can’t really see what’s happening from a photo, though, it just looks like a path of rocks. So, no photos of that.